Are you not receiving email notifications from your WordPress contact forms? Setting up Simple Mail Transfer Protocol (SMTP) on your site is the best choice for ensuring high email deliverability. In this post, we’ll show you how to set up WordPress SMTP Using Amazon SES. WordPress uses the PHP mail function to send emails that are generated by a contact form plugin like WPForms. Often, WordPress hosting servers are not configured to use the PHP mail function, so chances are your WordPress emails, including the WPForms notifications, won’t even make into the spam folder. This is why we recommend using SMTP to send emails from WordPress instead of using the default PHP mail function. SMTP (Simple Mail Transfer Protocol) is an industry standard way to send emails that use proper authentication method to ensure email deliverability. While there are tons of different ways to set up WordPress SMTP on your site, most options place a limit on the number of emails you can send. Chances are you’ll stop receiving notifications if WordPress is sending too many emails in a short period of time. This is where Amazon Simple Email Service (SES) comes in. Amazon SES is a cost-effective email service built on the reliable and scalable infrastructure developed by Amazon.com. It ensures high email deliverability and is more reliable than sending out emails from your hosting server. In this post, we’ll be using the WP SES plugin to set up WordPress SMTP on your site. Note: This tutorial’s method requires you to create a free Amazon Web Services (AWS) tier account that expires in 12 months after signing up. Though you’re creating a free account, it requires you to enter your billing address and credit card information during the registration process. However, you will not be charged unless your usage exceeds the free tier limits. You can learn more about the AWS free tier offer here. 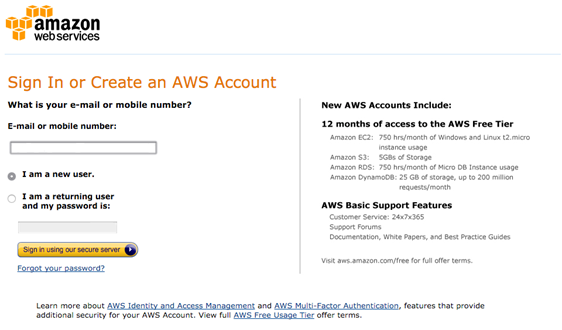 If you already have an AWS account, you can skip this step. If you don’t have an AWS account, go to this page to create a free account. 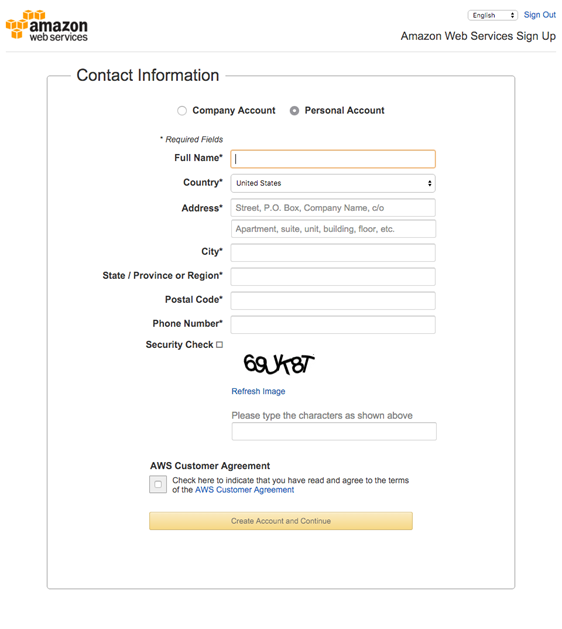 Now you’ll need to log in with your Amazon login credentials. If you don’t have an Amazon account, choose I am a new user, enter your email, and click Sign in using our secure server. 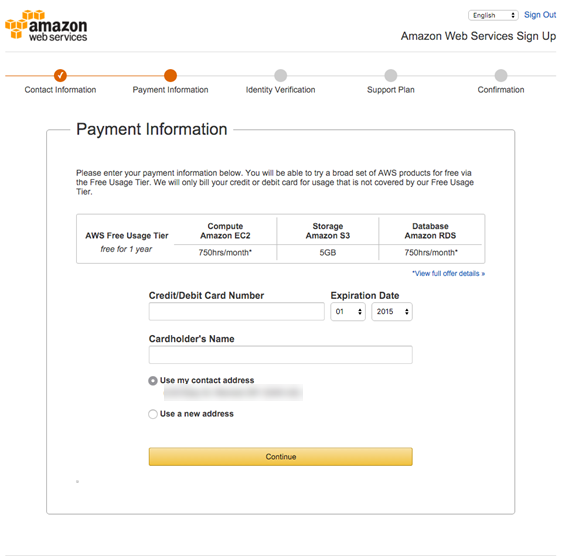 If you have an Amazon account, choose I am a returning user and my password is, and then log in with your credentials. 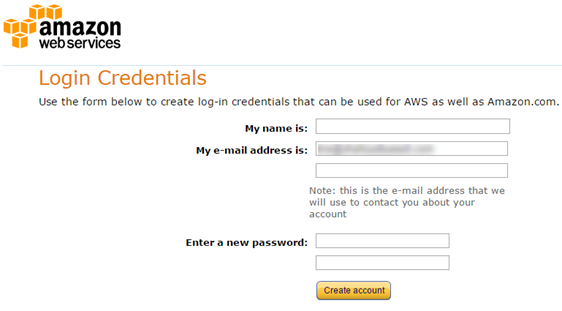 Now if you’re creating a new Amazon account, you’ll be asked to create new login credentials. Next, you’ll be asked to enter your contact information. The next step is to enter your payment information, including your credit card information and billing address. Now you’ll be asked to verify your phone number. Click the Call Me Now button after entering your phone number. You’ll get an immediate phone call from an automated system, prompting you to enter the PIN number provided. 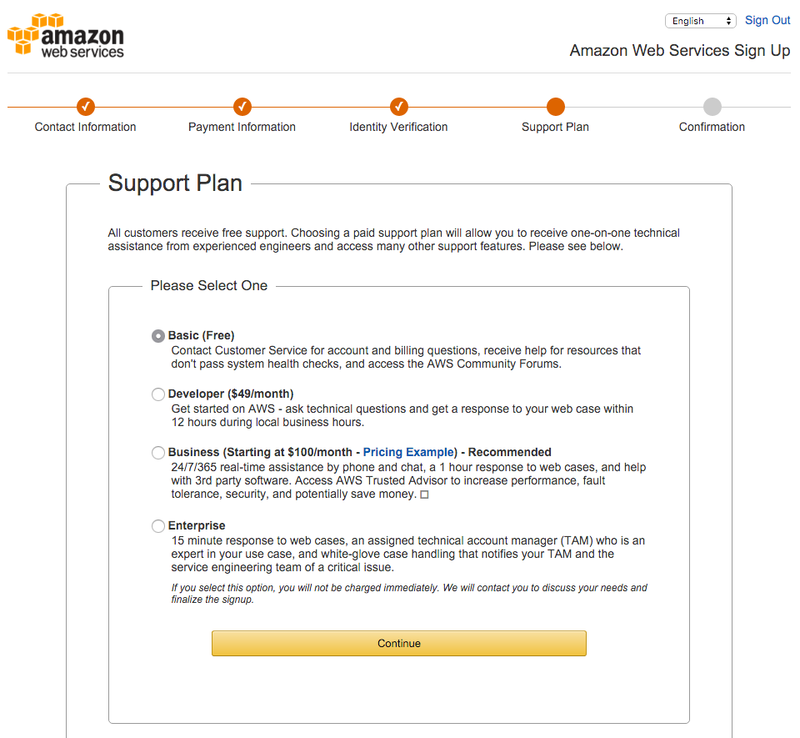 Now choose Basic (Free) support plan on the following support plan screen. Then, click Continue. Congratulations! You’ve just completed the registration process for a free AWS account. 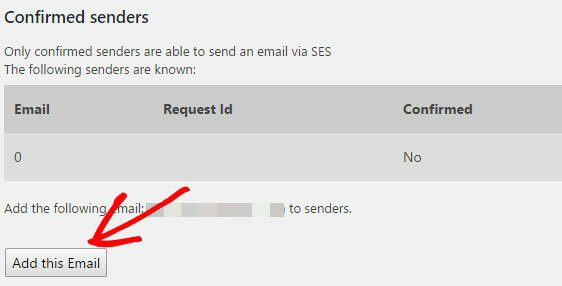 You’ll need to verify your email address before you can start using Amazon SES (Simple Email Service) to send emails from WordPress. Note: Make sure to verify the same email address you will be using to send SMTP emails. 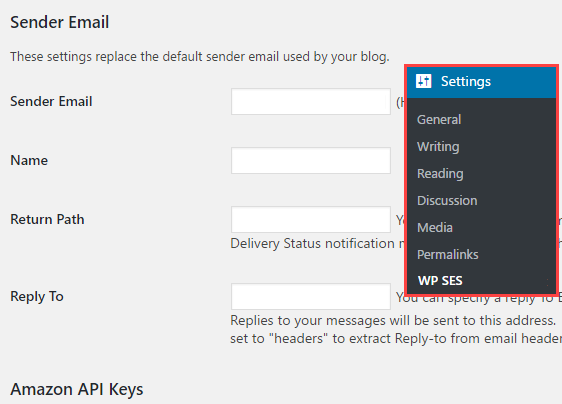 Additionally, in WPForms, the same email should be used in the Send From setting in your form notifications. 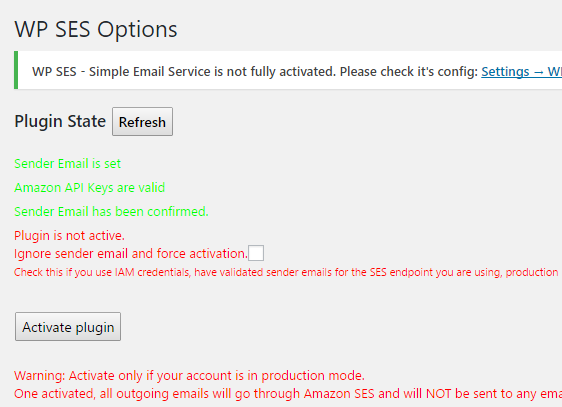 To verify your email in Amazon SES, sign in to the AWS Management Console and open the Amazon SES console. In the navigation pane, choose Email Addresses under Identity Management. Then, click Verify a New Email Address. Now you’ll see a popup where you’ll need to enter your email and click Verify This Email Address. 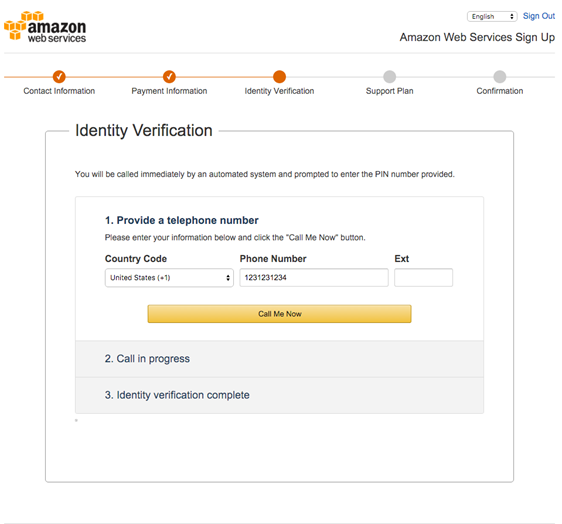 Now go to your email inbox where you’ll see a verification email from Amazon SES. In order to verify your email, you’ll need to click on the verification link. Now you’ll be directed to a thank you page where you can see that your email is verified successfully. Now that you’ve created an account and verified your email, it’s the turn to install and configure the WP SES plugin on your site. After installing and activating the plugin, navigate to Settings » WP SES. Under the Sender Email subheading, you may fill in the fields. Sender Email: Be sure to enter the same email you just verified in Amazon SES. Name: Enter your name in this field. Return Path: In this optional field, you can specify your email to which you want to send undeliverable message notices. Reply To: You can specify your reply to email if you want. Now just scroll down the page, and you’ll find the Amazon API Keys subheading. 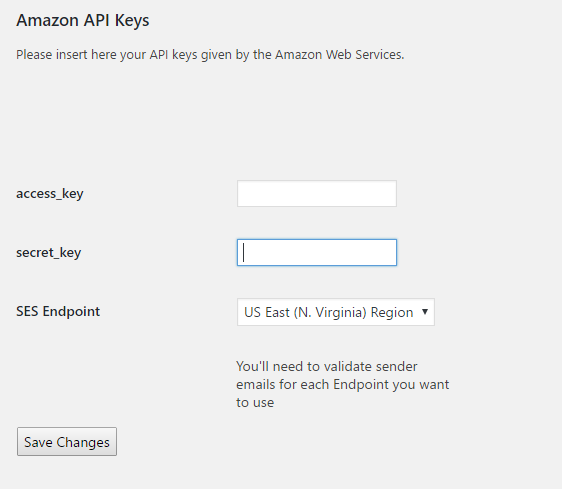 WP SES requires you to enter Amazon API Keys in order to function. You can find the API Keys by navigating to this link. If you’re visiting that page for the first time, you’ll see a popup box in which you’ll need to click on Continue to Security Credentials. Then, click Create New Access Key. To see the access keys, click Show Access Key. You can now find Access Key ID and Secret Access Key. Copy and insert them into the appropriate fields under the Amazon API Keys section. You may use any SES end point. Then, click Save Changes. Now under Confirmed Senders subheading, you’ll need to click Add this Email. You can send a test email by clicking the Send Test Email button under the Test Email subheading. After clicking it, check your inbox for the test email. If you received it, you’re ready to turn your plugin into the production mode. Scroll up your page, and under the Plugin State, click Activate plugin. That’s it! You’ve successfully configured WP SES plugin on your site. The WP SES plugin will now redirect all the WordPress outgoing emails, including your WPForms notifications through Amazon Simple Email Service instead of the local wp_mail function. Thank you so much for such thoughtful and well crafted instructions. You removed a lot of fears from this novice. Thanks for the tutorial! My WordPress developer has set up custom php contact forms on our site and my test emails have gone through using the WPSES plugin but the contact form emails are not sending. We are hosting WP server on AWS. Do you have any ideas as to why this might not be working? Any advice is much appreciated. It sounds like the best next step is to ask your developer to look into the PHP forms they created. Since the test email is working, the SMTP is good to go — which narrows the issue to something about the forms themselves. For example, the form may use `mail()` instead of `wp_mail()` (which would prevent the SMTP plugin from applying to it), or there could be an issue with the form submission (possibly broken headers or content). There are quite a few possible considerations within the form itself, but those are good places to start. I hope this helps, and your developer is able to track down the issue! This was incredibly helpful and saved me many hours of time. Thank you!! What about PHP mail() function inside the theme – will that automatically send out using this plugin? Or do we have to change using wp_mail()? Or do you have your own method? In most cases, an SMTP plugin will apply itself to all emails that are sent out from your site. However, you might need to make some adjustments. Specifically, many SMTP plugins will require that you go through your site and make sure that the From Email matches the email used to set up SMTP. So in this case, you’d need to check into what your site’s theme is using as a From Email and change it if needed. This is what allows SMTP to work — it uses the From Email (the email used to set up SMTP) to authenticate your emails and improve deliverability. So as long as the From Email setting matches, the SMTP plugin should be able to jump in and help send those emails. horrible advice! 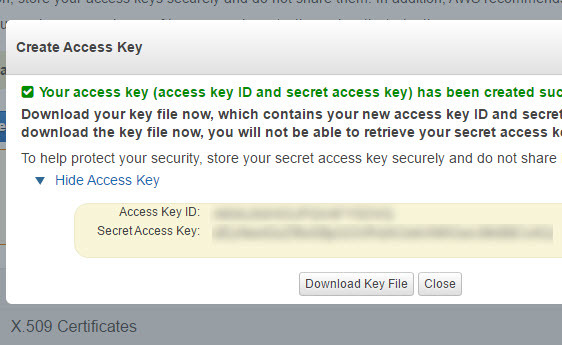 If you follow this tutorial you will actually use the ROOT access keys of AWS to access SES. Imagine that anybody would hack your WordPress > the attacker would get the root credentials to AWS and can do everything with it, including deploying servers and whatever. Hi Markus – Thank you for sharing your input, and this is definitely a valid concern. We’ll be improving this post in the near future to better address this. Thanks! Has the tutorial been updated to address the root key issue? The tutorial hasn’t been updated yet but our development team is working on a solution for this particular issue. I’m sorry I don’t have any further information for you at the moment but it’s definitely something that’s on our radar. Very helpful post! I am wondering if there is any way to change the email template when using WP SES? I was previously using the Email Templates plugin and it works great but it doesn’t seem to work with WP SES. Thank for your post. It’s really helpful. Is there any problem when using this WP SES plugin through Amazon API Keys? I’m sorry but I don’t quite understand your question? Can you please clarify? Okay, I will get paid WPForms license soon. Thanks.